Here's a game guide on how to effectively level up monster cards and player's lvl using all commonly dropped cards in the Action RPG puzzle card game - Tower of Saviors, available on Android Google Play and iOS App Store (mobile devices). Leveling up is one way of strengthening your cards or team, to make them ready for evolution, or to increase your account's Stamina and Team Cost. To increase the Level of your account, simply win all battles to receive EXP points. Note that Monster cards will not receive EXP points, only Skill points. Here are some notable methods to get high EXP rates. - Island bonuses with "Earned EXP +100%" or "Stamina needed -50%" stages. - At early game, you'll be leveling fast just by doing regular battles anyway, so this might not be necessary. Only complete these stages if you want to refill your Stamina by leveling up. - Daily Battles that are available during Saturdays and Sundays under the Lost Relic Special Battles. The Lost Relic can be found at the top left corner of the world map. - This option is the fastest way to further increase your Stamina count and Team Cost early game, grind here as much as you want. If you can only complete the Elite stage, it's ok, farm your EXP there. - Elite Stage alone is still recommended until or even after Lvl 50. - Aside from the above methods, the Zodiac Stages are the best in line. "The Traveler's Memories" will appear on the top right corner of the world map after unleashing "The Third Seal". - A lot of players prefer this method because it gives a nice amount of EXP points (15 Stamina = 1,500 EXP), plus, you can farm lots of common cards that can be used for leveling up your main monster cards. Monsters in these battles will also drop some items called Astropieces - used to pay for the Grand-master battles instead of Stamina. - Try to take down some of the easier Zodiac Master Stages, which are Libra (easiest), Capricorn, Cancer, Aries, then Pisces. You can do any of them, depending on your current team or card deck. - Once you reach this stages, check if the "Earned EXP +100%" or "Stamina needed -50%" bonus event is active around here. If yes, then it is better to farm EXP points there for now than the Zodiac Stages. Recommendations until before unleashing the 3rd Seal Boss: Odin Knight of Remains. 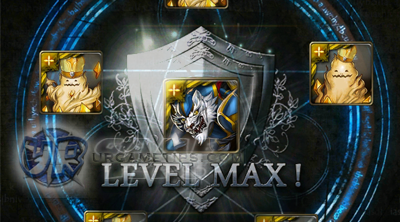 - While leveling up or combining monsters, you can also get a chance for random EXP bonuses like "Perfect" (+200% EXP) and "Brilliant" (+150% EXP). - You can find them randomly around regular battles. - You can also find them in the "Lost Relic" and "The Traveler's Memories" battles. - Rewards and can be drawn from Friend Point Seal. - Go here to check all Level Up cards. Combining Monster Cards Part 1! - This is a very helpful method because it can effectively help you use your common monster cards for leveling your main cards with awesome EXP points, plus it can also help clear your inventory. - Note: 2* = means the card has 2 Diamonds (seen via Card Profile) or Rarity 2. "Best Ratio" means the most productive Lvl of the card that gives more EXP than what you invested in it. Do not exceed the "OK" Lvls because they will produce less EXP than what you invested. - Lvl 4 is the Best EXP In/Out Ratio, Lvls 5 to 9 are OK though. - Lvl 7 is the Best EXP In/Out Ratio, Lvls 8 to 14 are OK though. - Lvl 3 is the Best EXP In/Out Ratio, Lvls 4 to 7 are OK though. - Feed two [Lvl 1 Gnomes] to a [Lvl 1 Slime], to get a [Lvl 4 Slime]. - Next, feed your [Lvl 4 Slime] to an Elf, to get a [Lvl 7 Elf]. - Feed your [Lvl 7 Elf] to your main card, or feed it to a [Lvl 1 Little Witch] to get a [Lvl 7 Little Witch] with 8,550 EXP when used to feed your main card (with same attribute). - There are so many combinations to do this method, just experiment and find a way to reach the target Lvls above using the available cards in your inventory. The key is, the lesser cards you feed to reach the target Lvl, the better. - Since sometimes, you'll get more cards than Witches, it is ok to feed a slime to a slime, an Elf to an Elf, or any number of cards you want to any card, your choice, just reach the target Lvls above. - Note:Rarity and Lvl of the monsters will also affect their EXP points. - Feed one [Lvl 2 Gnome] and one [Lvl 2 Salamander] to a [Lvl 2 Elf], to get a [Lvl 7 Elf]. - Feed your [Lvl 7 Elf] to your main card, or feed it to a [Lvl 1 Little Witch]. - Feed one [Lvl 3 Wolf] to a [Lvl 3 Elf], to get a [Lvl 7 Elf]. After reaching the required Lvl of monsters above, feed them to your main card/s. Remember, feed them to cards with same attribute for higher EXP output. Why Only Use Slimes, Elves, and Witches? - The point is, if you feed 1,000 Exp on them, you can get 2,000 Exp more if you use them to Lvl up your main cards, this way you'll get more than what you have invested, and saving you more Coins. Compared to other higher farmable common monsters like Gnomes, Wolves and Salamanders, the 3 monsters above will generate better EXP based from tests. What to Do with Gnomes, Salamanders, and Wolves Then? - Feed them to the 3 recommended monsters above, or if you don't have enough space, use Decompose to sell them for Coins. - If you have extra slots, use them as temporary team members. - For other cards, just keep them for later use, or use them as side deck cards. - Lvl 1 monsters with "Lv.Max." are used for Evolving or Leveling Up, check their Profile > Race to confirm. Feeding "For Evolve" monsters will only generate low Exp, so either keep them for later use, or sell. Check your main cards' Evolve Materials to see if you need them. What to Do with "For Lvl Up" Element Cards? - Lvl 1 monsters with "Lv.Max." are used for Evolving or Leveling Up, check their Profile > Race to confirm. Keep or just feed low rarity "For Level Up" monsters to your Elf or Witch to get better Exp. - Higher Rarity cards gives better EXP, either feed to another card or to your main. Recommendations after unleashing the 3rd Seal Boss: Odin Knight of Remains. - Zodiac Stages: Level up the "Fractured Guardians" to Lvl 15 (maxed) then evolve them before feeding them to your main cards, no need to max their Lvls after evolving. There is also some bonus EXP when you feed these guardians to certain Zodiac cards. Combining Monster Cards Part 2! - Note: 3* = means the card has 3 Diamonds (seen via Card Profile) or Rarity 3. "Best Ratio" means the most productive Lvl of the card that gives more EXP than what you invested in it. Do not exceed the "OK" Lvls because they will produce less EXP than what you invested. - Lvl 9 is the Best EXP In/Out Ratio, Lvls 10 to 17 are OK though. - Lvl 10 is the Best EXP In/Out Ratio, Lvls 11 to 18 are OK though. Where to Farm 3* or Rarity 3 Elves? - 4th Seal Islands: Same locations depending on their attribute. - Farm during "Seal Card drop +100%" or "Stamina needed -50%" ("better") bonus events for better results. Where to Farm 3* or Rarity 3 Witches? - 4th Seal Islands: This time, they are mixed up! - "Water Witch" > Misted Woodland Island > The Wild Plague stage. - "Fire Witch" > Glacial Iceberg Island > Ambush Under the Water stage. - "Green Witch" > Afire Volcano Island > The Burning Metal stage. - "Light Witch" > Dark Cove Island > The Nightmare stage. - "Dark Witch" > Holylight Palace Island > The Bright Guidance stage. - 5th Seal Islands: Same locations depending on their attribute. A Lot of Players Are Leveling Witches to Lvl 11 to 13, Why? - Lvl 10 is the most ideal, it's just that sometimes, players have more common cards to feed than the number of Witches they have. Lvls 11 to 13 are still very good for Witches. - Same, feed them to the 3 recommended monsters above, or to the Guardians. - On your screen, "Tap and Hold" during combine animation to speed it up. - After that, select the "Back" option to skip the leveling up card animation screen. Sort Inventory to Make Things Easier! - By default your inventory is sorted by "Time", select that option and turn it to "Attribute" instead. - Join Guilds in the game because Guild members have access to special Evolution Elements, Soulstone Battles, and daily guild missions.